The St. Regis Bora Bora Resort’s main boat dock. 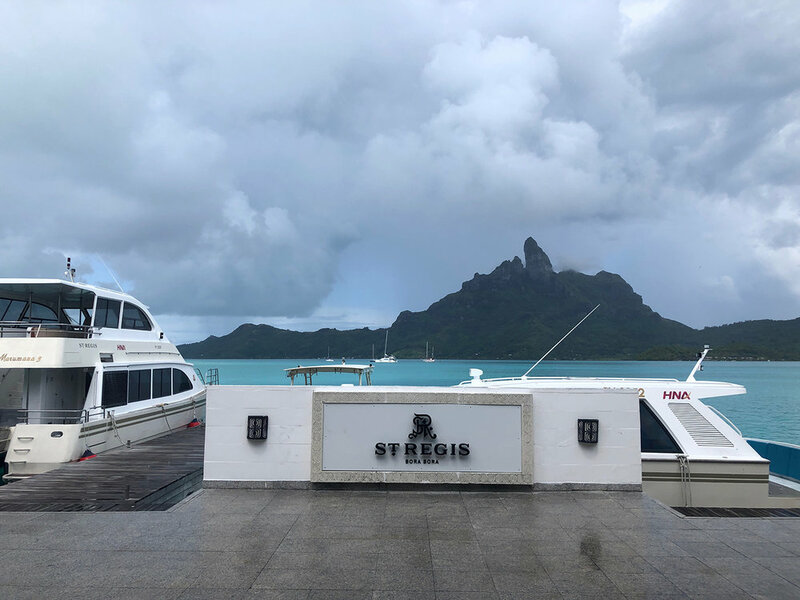 During my recent honeymoon in Bora Bora, I had the pleasure of staying at one of the best resorts in French Polynesia: The St. Regis Bora Bora Resort. Featuring the largest overwater villas in the South Pacific and an on-call personal butler service, the luxury resort offers guests an unparalleled experience in a private island paradise. I was equally excited to spend a day with my husband, Eric, at the resort’s spa, Miri Miri Spa by Clarins, which is situated on its own private island in the resort’s lagoonarium—a protected underwater sanctuary for multiple varieties of tropical fish and coral, including Napoleon fish, which are able to easily change colors. The St. Regis Bora Bora Resort is home to overwater and land villas with exceptional amenities. The spa is located on its own island in the middle of the resort’s private lagoonarium, which is open to all resort guests. The 13,000 square-foot spa offers an extensive menu of Polynesian, Asian, and Clarins Touch treatments. The Relaxation Room offers open-air views of the private lagoonarium and secluded beach, which face majestic Mount Otemanu. All spa guests enjoy complimentary access to His and Hers spa facilities, which include whirlpools, steam rooms, and saunas. The spa has two private wellness areas, one with a swimming pool and the other a hot tub, that guests can reserve before or after their services. Water treatments are available in the form of balneotherapy and Vichy showers. The spa also offers massages in the privacy of your own villa at a 50% surcharge. Manicures and pedicures services are available, as well as a makeup facility. Couples can sign up for romantic spa treatments, ranging from an outdoor candlelight massage to a chocolate lovers’ package. Guests can order lunch to be enjoyed lagoon-side before or after their spa treatments. The resort’s 24-hour state-of-the-art fitness center, fully equipped by Technogym, is located next to the tennis court and also overlooks the lagoonarium. The entrance to Miri Miri Spa by Clarins. The resort’s private saltwater lagoonarium offers stunning views of Mount Otemanu. 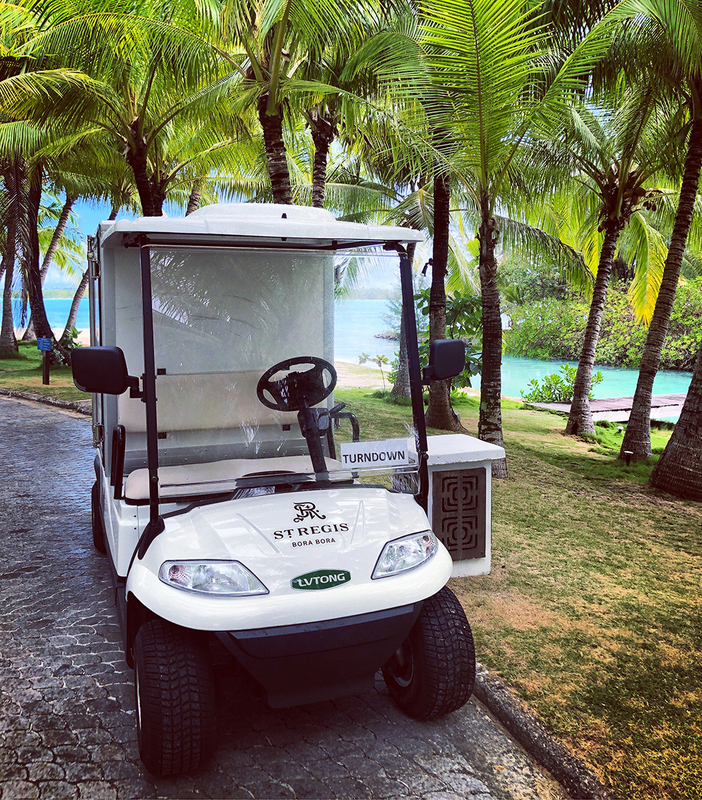 Upon our arrival to the spa by golf cart (my favorite way to get around the 44-acre resort), we were greeted by Spa Director Aurelie Chiaffi, who proceeded to give us a tour. At 13,000 square-feet, the luxury spa features an array of generous amenities, and one of the things that I love most about Miri Miri Spa by Clarins is the integration of the outdoor and indoor spaces so that they seamlessly blend into one another and you never feel confined. 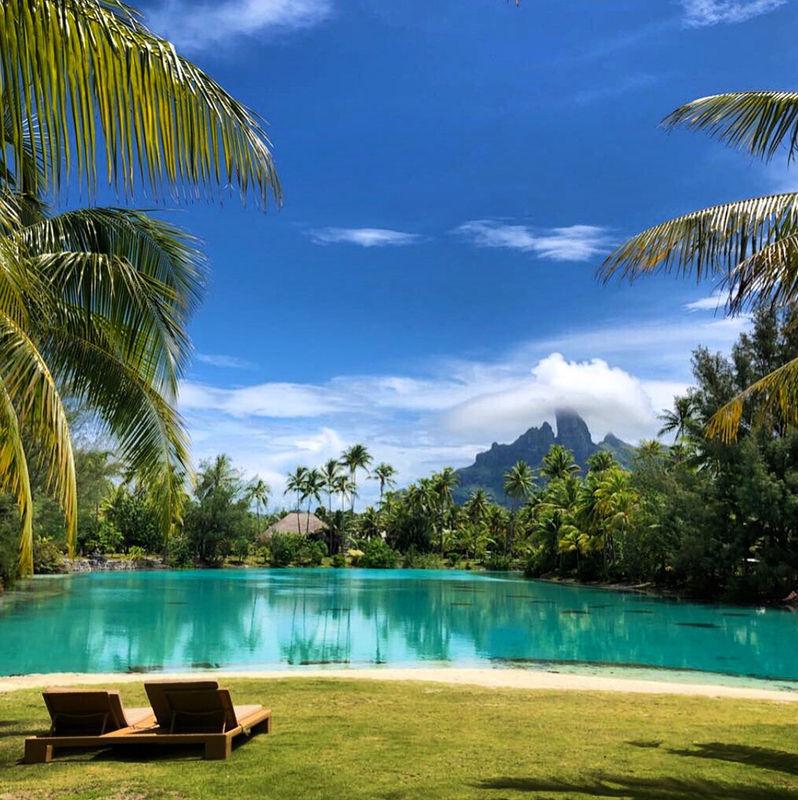 Upon arriving at the spa, guests are welcomed by the expansive lagoon and mountain views, and there is lots of open space where they can relax while surrounded by the beautiful elements of nature, from coconut trees to fragrant flowers. The hallways leading to the treatment rooms and changing area are all open-air, as is the reception area where guests check in. There is also an outdoor massage pavilion where singles and couples can opt to receive their spa treatments, if desired. The spa also has an outdoor pavilion facing the lagoon where guests can opt to receive treatments. 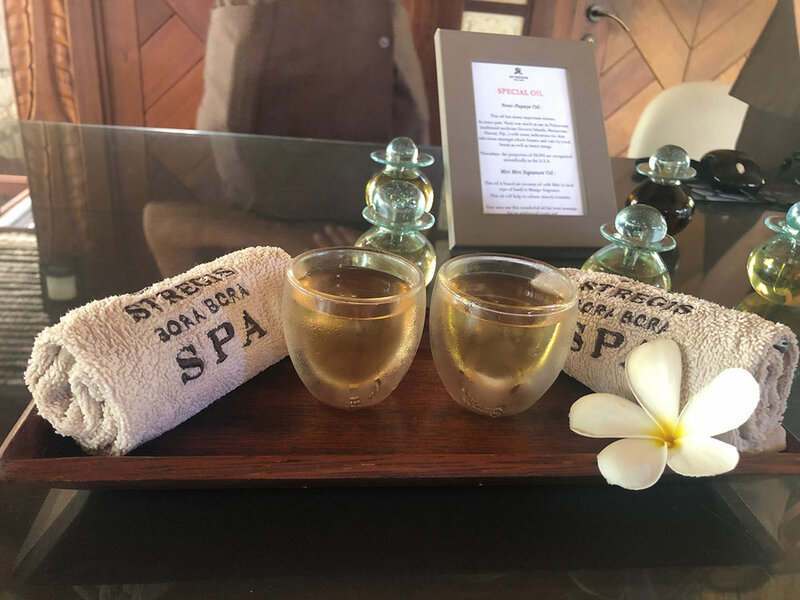 After we had finished the tour and changed into our robes and slippers, we headed back to the spa’s reception desk, where Eric and I were served cold tea and chilled towels infused with the scent of frangipani—a fragrant flower (also known as the plumeria) that is native to tropical areas. Frangipani is one of the most popular ingredients in Bora Bora, commonly used as a fragrance in skin care products such as monoi oil. Prior to our spa services, we were offered cold tea and chilled, fragrant towels. Miri-Miri Oil (made with basil and mango) - This oil is based on coconut oil with Miri (a local type of basil) and mango fragrance. This oil will help to release muscle tension. Noni/Papaya Oil - This oil is used to treat skin infections including bruises and cuts by coral, burns, as well as insect stings. Fun Fact: Chiaffi has a hand in overseeing the development and formulation of the spa’s St. Regis skin care products, such as body oils and exfoliating scrubs—all made with pure, natural ingredients. And trust me when I say, they’re all amazing! The spa also offered us our choice of oils to use in our treatment. Before meeting my husband in one of the spa’s private wellness spaces that we had reserved before our massages, I headed back to the women’s changing room to enjoy some of the amenities. The entrance to the women’s locker room. In addition to an indoor lounge that has a snack table serving dried fruit, nuts, water, and an assortment of teas, there is a nice outdoor patio that has its own hot tub, steam room, and sauna. The women’s changing area also has a small fridge filled with cold towels, which were extra refreshing during the hot and humid afternoon. I placed one over my face during my steam session, which was super refreshing. The patio in the women’s outdoor lounge area. The women’s lounge also includes a private Jacuzzi. After enjoying the women’s facilities, it was time to head to the private wellness area. Miri Miri Spa by Clarins has two private wellness areas that guests can book in 30-minute increments to enjoy before or after their services. The cost is 15,000 xpf ($150) for half an hour. 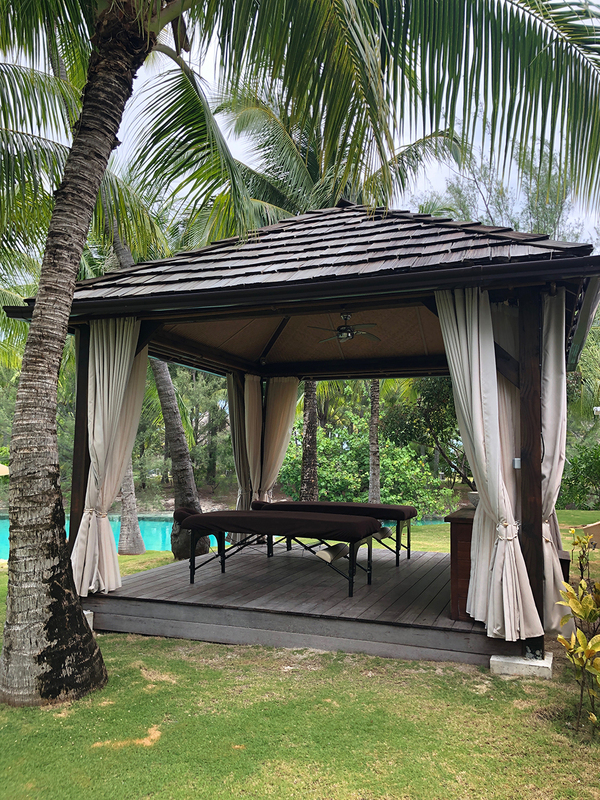 The treatment area we reserved prior to our spa services had a private whirlpool, steam room, outdoor shower, and covered pavilion where we relaxed in the shade and stayed cool while sipping on our favorite island drink: fresh coconuts. You can literally order a coconut and have it delivered to you anywhere at the resort, so I often found myself drinking up to three coconuts a day—morning, afternoon, and evening! The spa’s treatment rooms feature beautiful traditional Polynesian decor. One of the spa’s private wellness areas has a solar-heated hot tub and shaded pavilion for lounging. There is also a private steam room. 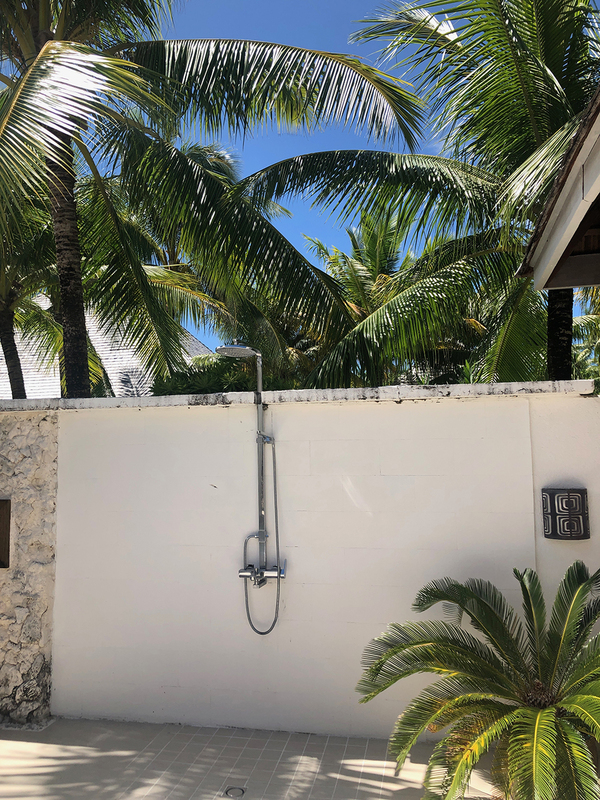 The refreshing outdoor shower in the private wellness area. After our 30 minutes were up, Eric and I went to separate treatments to receive our individual massages. He had signed up for the 90-minute Balinese massage, which features deep tissue techniques and uses long strokes, pressure points, and stretching to help relieve tension and stress, while improving circulation. When I asked him how the massage was, he said that his therapist really went deep into the muscles and spent a lot of time on his knots—he felt a little sore afterwards, but in a good way. I opted for the 90-minute Taurumi (Polynesian) massage, which felt like the equivalent of Swedish massage, and was very relaxing and soothing. My therapist knew exactly how much pressure to apply and where. She worked on some of the knots in my upper shoulders, helping to melt them away, but avoided doing any extensive deep tissue work, instead focusing on keeping the treatment relaxing. 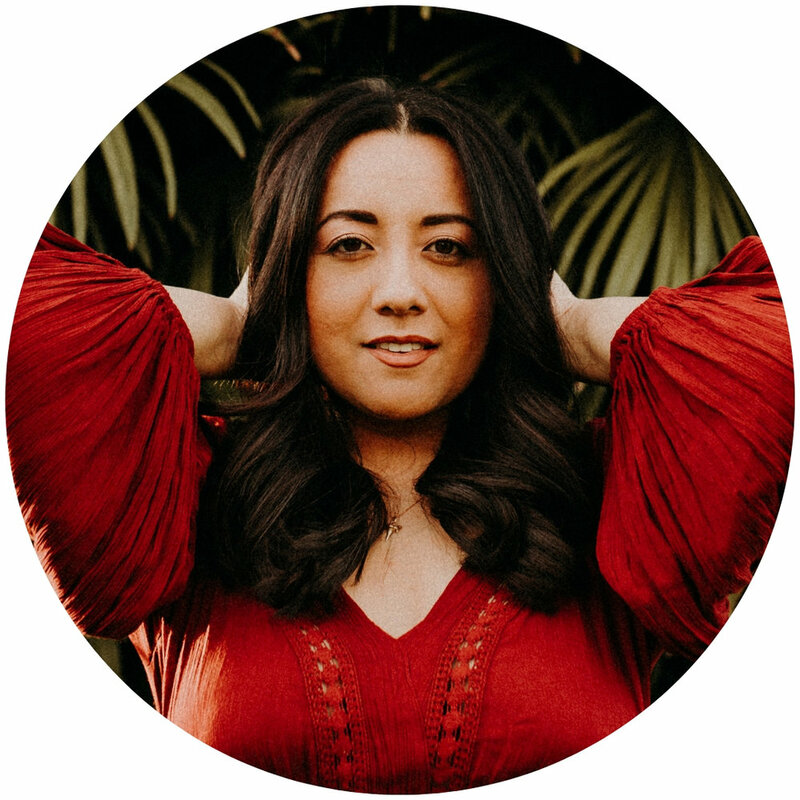 So depending on whether you’re looking for a more relaxing massage or to get some of those deeper knots and muscle tension worked out, both the Polynesian and Balinese massages are great options. 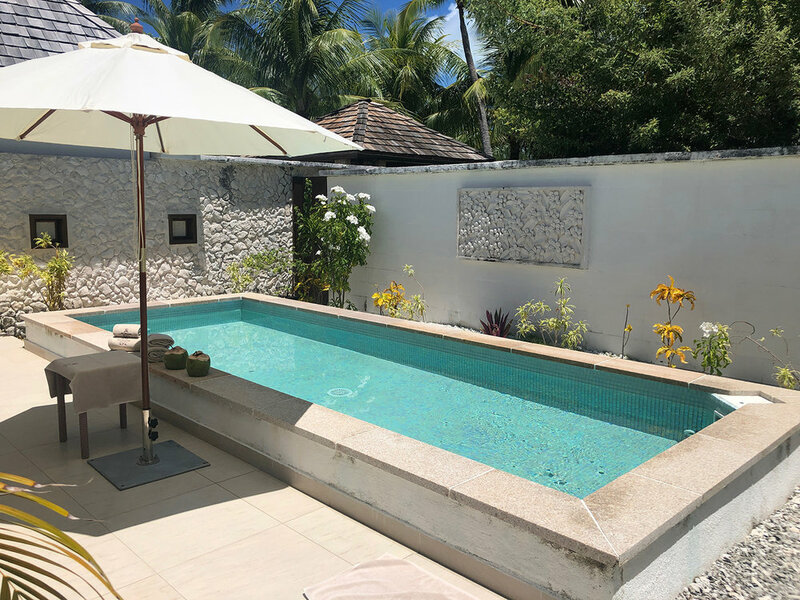 The spa also offers Thai massage, Tahitian hot stone massage, foot reflexology, as well as a customizable massage that can be adapted to your specific needs. One of the spa’s five treatment rooms. A wood-carved manta ray greeted me prior to my massage. After my session had concluded, I made my way over to the spa’s other private wellness area to meet Eric yet again. 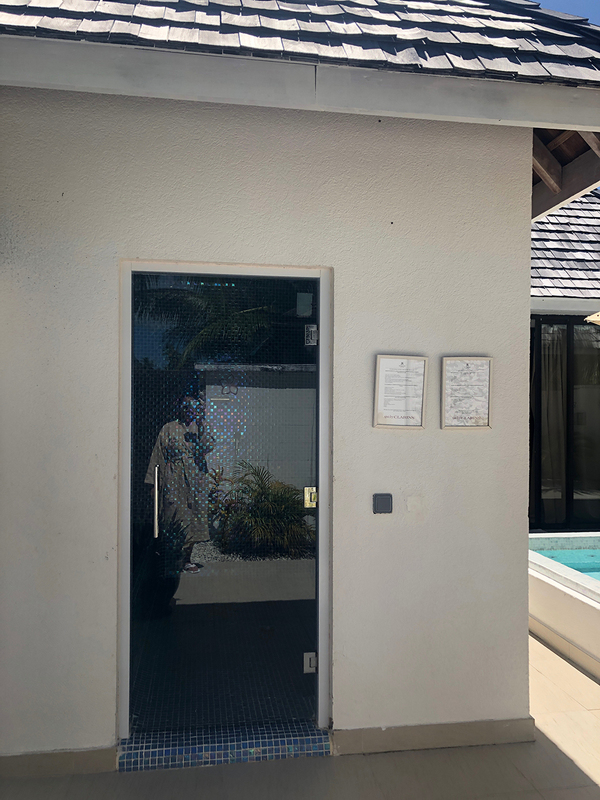 This space had a private pool and outdoor shower, where we proceeded to relax while drinking another round of coconuts. A copy of the room service menu was dropped off for us to browse, and after we put in our orders, we were informed that the food would be waiting for us at one of the tables next to the lagoon in 30 minutes. The food menu features a wide variety of sandwiches, burgers, fish, and salads, as well as desserts and cocktails. I’d become a huge fan of St. Regis’ fish and chips, which had been recommended by a fellow guest. I loved the fish and chips so much that I ordered it three days in a row—it was the perfect companion to Hinano Beer, which is the popular local beer in Tahiti. The spa’s other private wellness area has its own private pool. 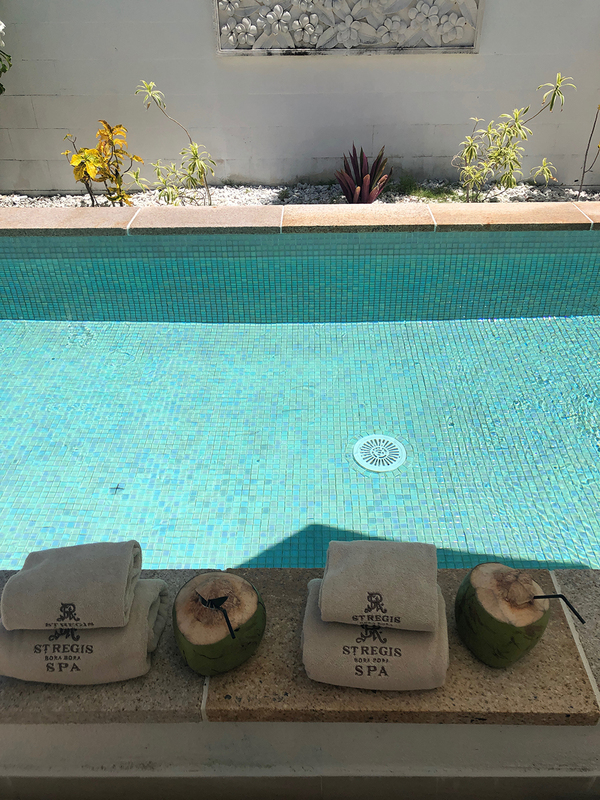 Fresh towels and coconuts awaited us after our spa treatments. Balneotherapy ($95/20-min) - An effective treatment for cellular oxygenation, vasodilation, and blood stimulating, while bubbling water brushes and massages the body with essential oils while you relax in a tub. Body Scrub & Vichy Shower ($120) - Skin is renewed with a body scrub using local products while under the Vichy Shower. I made a vow that next time I return to St. Regis, I will try these treatments—they’re on my to-do list! The spa also offers balneotherapy, where bubbling water brushes and massages the body with essential oils. 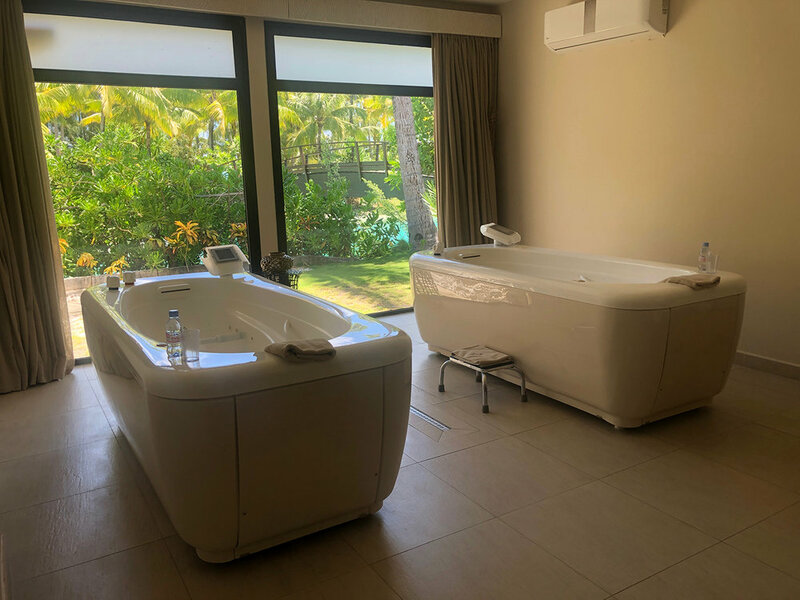 After our private wellness area session had concluded, we made our way to the Relaxation Room, which is air-conditioned and features several comfortable beds that guests can lounge on while enjoying unobstructed views of the lagoon and Mount Otemanu. An assortment of teas are also available, which you can sip on while snuggling up under one of the super soft blankets that are provided. I lightly dozed off until we got the call that lunch was ready. Another nice thing about the spa is that it has many different areas where one can hang out and enjoy some privacy. Eric and I enjoyed eating at a table located next to the lagoon, behind the Relaxation Room. It was extremely peaceful and quiet, and we felt as if we had the entire place to ourselves. The co-ed Relaxation Room looks out onto the lagoonarium and Mount Otemanu. We sipped on tea in the Relaxation Room after our massages, before ordering and enjoying lunch next to the lagoonarium. As with any spa visit, I made sure to stop in the spa’s retail boutique, which is also where the manicure/pedicure stations are located, along with the makeup application room. The store, which carries all sorts of Clarins products (many of which are used in the skin care treatments), also has a line of St. Regis skin care products that are formulated by Chiaffi herself. Because I can’t resist good skin care, I purchased several containers of the spa’s Black Pearl, Mango, and Pineapple Body Scrubs, in addition to various body oils—coffee, vanilla, monoi, frangipani, and noni-papaya—so that I could keep up my Tahitian skin care routine when i returned home. Tahitian women are known for their beautiful, glowing skin, and during my trip I noticed that I didn’t suffer from dry skin even once. And while my suitcase was definitely 20 pounds heavier going home, it was absolutely worth it. Next time I’m bringing a second suitcase so that I can take home ALL of St. Regis’ amazing skin care products! 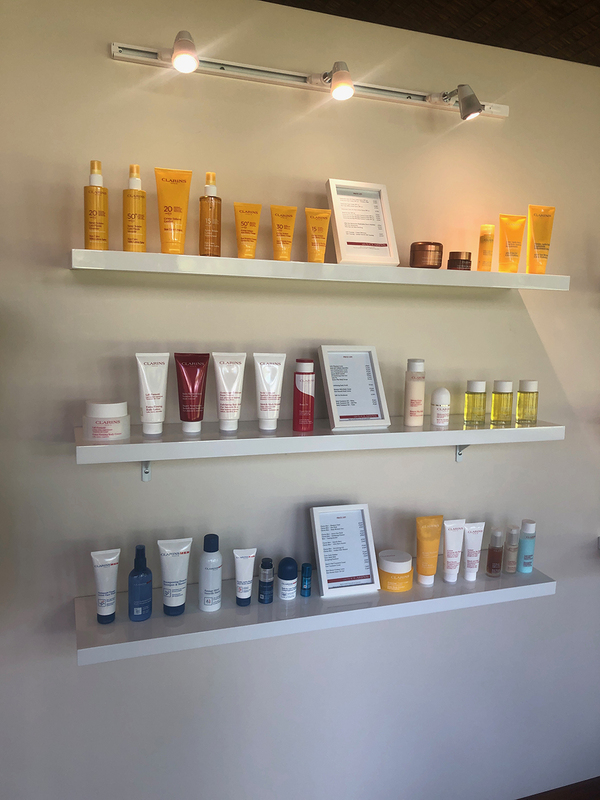 For those that are fans of or curious about Clarins, the spa also has a variety of facials, massages, and body treatments that incorporate different products from the brand. Clarins offers an enhanced spa experience using patented therapeutic treatment methods and products created from sophisticated plant science. 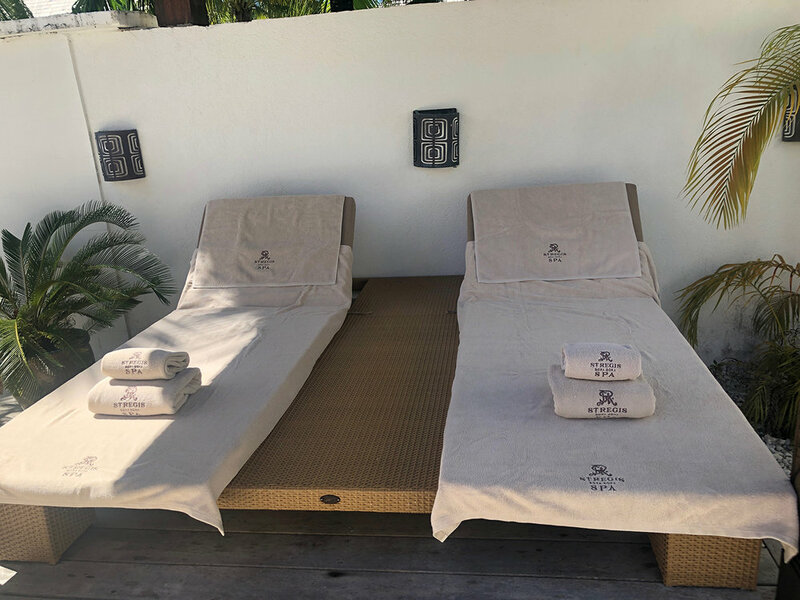 I actually came back to the spa two days later to experience the After Sun Stopover—a 60-minute treatment that hydrates the skin, optimizes the benefits of the sun, and helps prevent any of its drying effects. Definitely recommended if you get a sunburn or have super dry skin! 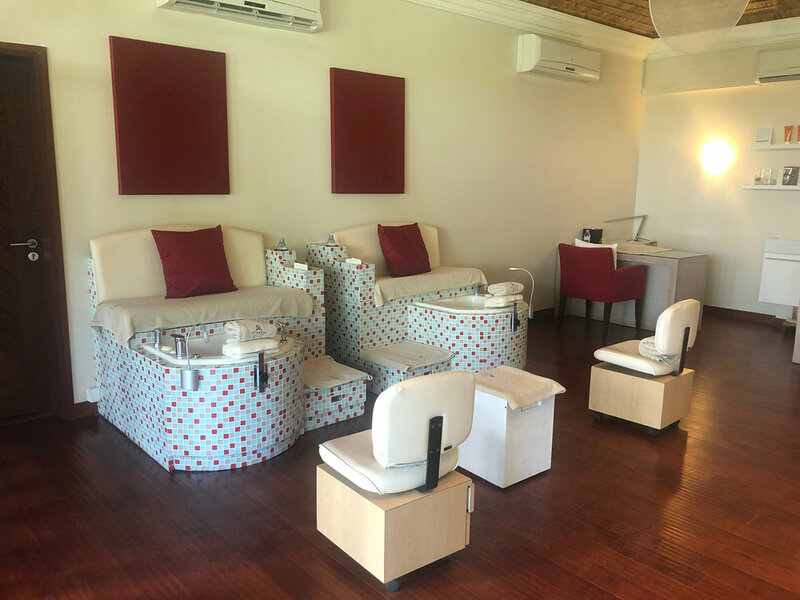 The spa’s manicure and pedicure area. 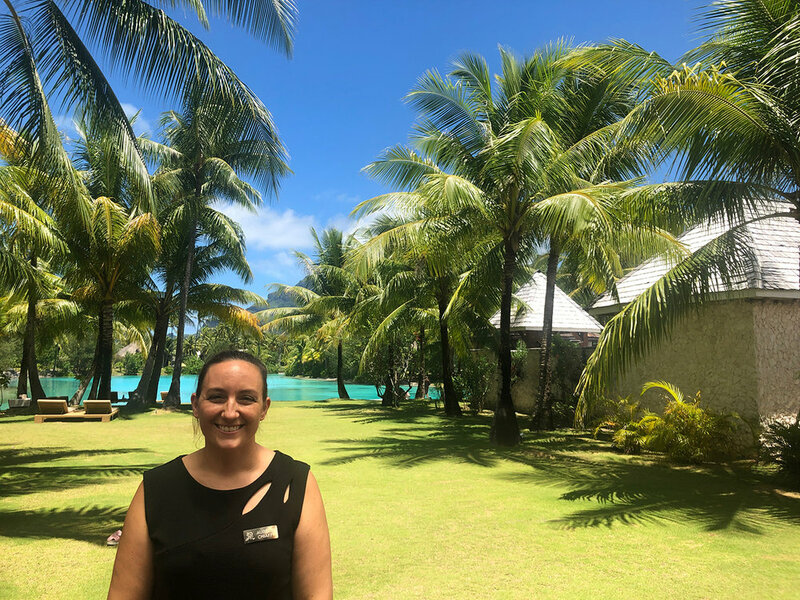 During the remainder of our stay at St. Regis Resort Bora Bora Resort, we made sure to spend time at the spa’s lagoon almost daily. 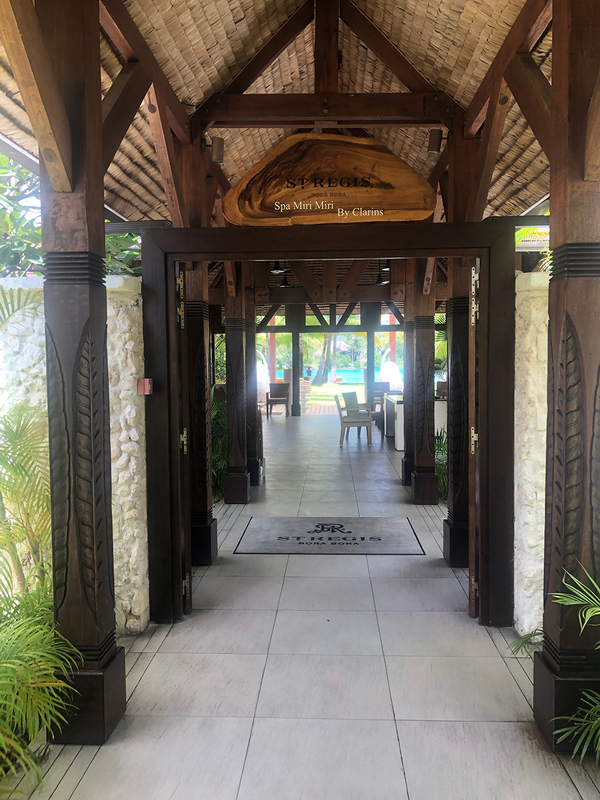 It became our favorite spot with its magical views of Mount Otemanu, and while the lagoonarium is open to all resort guests, it remains somewhat of a hidden gem that not everyone knows about. 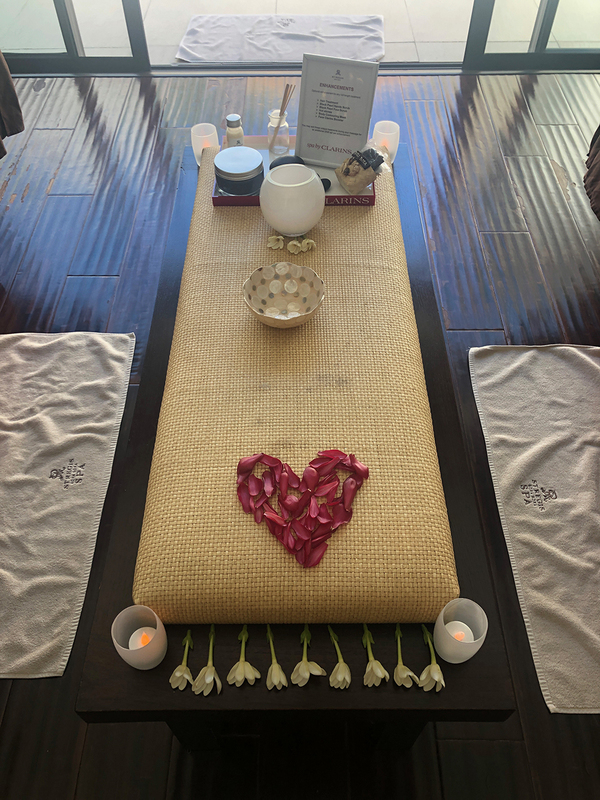 The spa’s staff was extremely accommodating, making sure to tend to our every need, and we really appreciated the attentiveness and helpfulness of everyone that we crossed paths with. 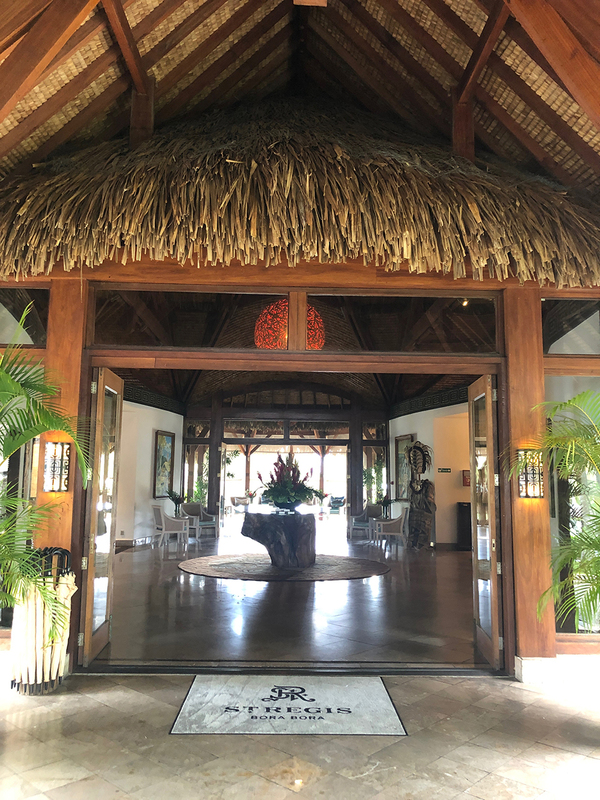 St. Regis Bora Bora and Miri Miri Spa by Clarins have definitely earned a special place in our hearts, and there is no doubt in our minds that we will be coming back to visit again soon. The retail shop includes a vast selection of Clarins products and St. Regis skin care. Insider Tip: ﻿The spa’s private lagoonarium, which features some of the best views at the resort, is open to all guests—even those without spa reservations. Enjoy a snorkel session or refreshing dip before or after your treatments, or just come to relax and order lunch.